This ability is supernatural, so you can never discover it using science. You can’t dissect dogs to find out how this ability works. It is outside the scope of your ability to study or even understand. Furthermore, dogs intentionally hide this ability from humans. Dogs only speak when humans aren’t around, and they have the ability to know if humans are eavesdropping in any way. So, you will never catch them in the act. You can’t prove that this isn’t true. It’s entirely possible that it is. 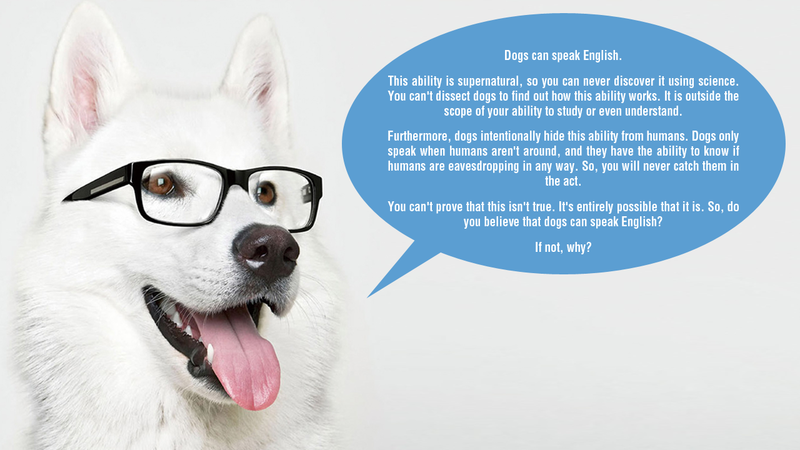 So, do you believe that dogs can speak English? As you read this, you realize two things. First, we all know that dogs do not speak English. Second, we do not need to prove that this is true. If someone wants to assert that dogs can speak English, they must provide evidence that the assertion is true. If they cannot, their assertion is merely amusing. This is exactly the same situation we find whenever a theist talks about God. The theist assertion is that God is supernatural and outside the scope of our ability to study or even understand. Furthermore, it is asserted that God is invisible, silent and cannot be detected in any way by science. Since this is the assertion, the only way that anyone with any sense would believe it is through evidence. If any sensible, intelligent, rational person is going to believe in God, there must be evidence. Since there is no evidence for God, the assertions of theists should be merely amusing. But they are not. Unfortunately, theists combine their God-nonsense with a desire to make many people miserable, to inhibit the freedoms and civil rights of millions, to stop the progress of science, etc. In other words, God-nonsense is extremely dangerous to society as a whole. For this reason, God-nonsense is not benign – it is a cancer. It should be eliminated. For more information see God is imaginary. “Today Christmas has become a commercial celebration, whose bright lights hide the mystery of God’s humility, which in turn calls us to humility and simplicity,” the pope said after recalling the story of Christmas. Humility and simplicity? This from a man who lives in his own gilded city, waited on hand and foot while sitting on his golden throne and holding his golden staff? The statement is unbelievable in its hypocrisy. So when will the atheists and maintainers of this blog be proving God does not exist? I have been visiting time to time for a year, but nothing is ever offered. If you are saying that Zeus exists because no-one proved otherwise, then you are saying that all gods exist. Now that’s a remarkably stupid statement and one that would put you at odds with the one-true god line of Christianity. So, let’s assume you are saying that Zeus does not exist. Fine, you just took the position that Zeus does not exist because no-one proved that he exists. Will you apply that standard to the other 10,000 gods also worshiped by man, or do they exist for you and, again, you’re not a true Christian? At this point, unless you are being intellectually dishonest, you must take the same position and standard with all gods, including yours. Hence, you must prove your god exists or make it clear that you believe every and any god ever proposed by any man exists. You won’t have proved anything, but you would be consistent. So, which is it, Ian. Does Zeus exist or not exist and using the same standard, what do you have for your god? The following post was seen in the comments and deserves examination. It shows how wishy-washy Christians can be. This conversation represents one level of Christianity. A Bible-literalist would answer another way, and a more casual Christian would answer still another. Unlike many of the people that post here, most of the Christians I know are nice people. However, they don’t realize that they don’t actually believe in the bible nor do they really follow the teachings of Christ. If you have a conversation with them, it goes like this. “Do you believe in god?” Yes, of course I do. “You believe that god created the world?” Yes. “An entire universe, just for us?” Well, maybe not just for us. “He created man from a handful of dirt?” Well, no, not like that. “He created women from a man’s rib?” Well, no, not like that. “How about the talking snake?” Well, that’s a metaphor. “The tower of Babel?” Well, that’s just a metaphor too. “Noah’s Ark?” Yes, that happened. “Two of every kind? From all over the world, including the continents Noah didn’t know of, and they all had enough food and water, space, didn’t die or eat each other?” Well, it didn’t have to happen exactly like that. Perhaps it’s just a metaphor. “Physically walked the earth?” Well, maybe in spirit. “Murderers who convert on death row go to heaven?” Yes, if they believe. “That’s not what the bible says” Well, my god wouldn’t do that. My preacher says they do. “Do you follow the ten commandments?” Of course I do. “So you rest on the Sabbath?” Well, no, but I follow the others. “You sure?” Well, as best I can considering that times have changed. “Aren’t they the word of god?” Well, things are different now. That was the old testament. “All of them?” Well, my preacher tells us what’s important and what’s not. “Why do you believe all these things?” I’ve never really thought about it, it’s the way I was brought up. “What about the other gods, do they exist?” Of course not. “But yours does and theirs doesn’t?” I’ve never really thought about it. “Can you prove your god exists” No, but I want to believe that it is true. “Why do you go to church?” I enjoy the service and the community. “What that church?” I tried several others and I didn’t like the service or the preacher. “So you church-shopped?” Yes, you have to find a church that is comfortable for you. “Is your religion important to you?” It is about how we live our lives as Christians. “So it’s more about philosophy or way to live a good life than taking everything in the bible literally?” Err, yes, I suppose it is. Christopher Hitchens will endure an eternity of torment in Hell according to the video. That, in itself, is completely immoral. Torturing people is, by definition, immoral. If Christopher Hitchens is in Hell, it is because God loves him. According to Christians, eternal torture is an expression of love. Only a completely immoral body of people could decide that torture=love. It is an insult to religious people everywhere… The idea that you would lightly state that people are suffering and dying in order to prove that God is on the side of a politician is sickening. The only reason that Bachmann and Rick Perry are able to say this stuff is because of a magic word, and the magic word is Christian. As soon as you look at the Bible, the idea of religious morality collapses in the most embarrassing ways. The God of the Bible is the most abominable, disgusting, immoral being in the universe by any objective measure. 1) The show demonstrates that Muslims are just as delusional as Christians and any other religion’s follower. Learn about the delusion of Muslims here. Is that not the purpose of education vis-a-vis belief structures – to replace your belief structure with facts. I don’t like the show Nova because it is harmful to my belief structure that the ocean tides are controlled by monsters. It also helps explain why religion is invalid and should be ridiculed by every intelligent human being. A story of an estimated 15,000 children in Africa’s Niger Delta being denounced by Christian pastors as witches and wizards and then killed, tortured or abandoned by their own families. Return to Africa’s Witch Children is a documentary that follows the work of Gary Foxcroft, an Englishman whose charity, Stepping Stones, raises funds to help care for more than 150 children accused of witchcraft, and blamed for catastrophes, death and famine. Narrated by Sophie Okonedo. Why does this happen? For the same reason that Christians advance homophobia in the United States. The urge to kill these children is driven by the Bible. Yes, the call to pray for her that so many of us have experienced is that strong. Let me make this clear, though, to all the naysayers who are going to shriek about false idols and “don’t put her on a pedestal”. In these prayers, Sarah is not, and has never been, the primary focus of what we are asking from God. In the end, it has always been about Saving America, Saving God’s People, Saving Israel and Protection from the Darkness that seeks to denigrate humanity and enslave. Sarah, you see, is just a little worker for God (as are we). She is our sister in Christ and we believe God is using her to further His Will here on earth. Call us crazy, but that’s at the heart of why we pray for that God grant her guidance, wisdom and protection. In fact, I am going to take this one step further, and just announce to the world, right here and now: most of us have had our prayers accompanied with dreams, visions and the finding of revelatory scripture that confirm the urgent and relentless need for prayer over Sarah. Through the prayers, God has been able to reach us in other mystifying, supernatural ways. What a blessing these occasions have been to all who have experienced them. So there has never been any doubt in my mind that God is at work through Sarah. Logically, it’s the only thing that makes sense. Think of how many layers of delusion stack on top of each other in these few paragraphs. Think how detached from reality a person would have to be to write these paragraphs. most of us have had our prayers accompanied with dreams, visions and the finding of revelatory scripture that confirm the urgent and relentless need for prayer over Sarah. Through the prayers, God has been able to reach us in other mystifying, supernatural ways. What a blessing these occasions have been to all who have experienced them. She is our sister in Christ and we believe God is using her to further His Will here on earth. Call us crazy, but that’s at the heart of why we pray for that God grant her guidance, wisdom and protection. Why would an all-powerful being need any human to “further His Will here on earth”? Why wouldn’t a “god” do it himself? And if a “god” were to act through a human and provide “guidance and wisdom”, why wouldn’t the religious candidates absolutely blow us away with their intelligence, insight, and mastery of the world’s problems? Instead they appear to be idiots. Perry melts down in the debates. Palin and Bachmann melt down every time they open their mouths. Cain is accused of cheating on his wife for decades. It’s amazing that these god-assisted candidates perform so poorly. In reality, it is more proof that god is imaginary. Any intelligent person can see that God is imaginary, and that religion inevitably leads to a diminution of intelligence and insight. The only question that remains is this: how do we help Christians and Muslims free themselves from their delusions? Is there any way to help them heal? How in the world can Christians be so hateful and appalling on such a consistent basis? How can they not see that they ignore Jesus’s teachings at every turn? Is religion really this stupid? His basic idea is that some people are stupid enough to believe in ideas like “life after death” and “heaven”, as well imaginary people floating in the sky, and these people will modify their behavior based on these ridiculous beliefs. Any intelligent person who has ever looked at the biology of cells understands that there is no “life after death” – the idea of life after death is ridiculous and impossible. And any intelligent person who has taken the time to read the Bible understands that the Christian “god” is imaginary, as are all other “gods” that mankind has created throughout history. How could any intelligent person believe in something as stupid as religion? I don’t think hell exists… Religion is always in the control business. And that is something people don’t really understand. It is in the guilt-producing control business. What’s amazing is that, because “god” is silent (because he is imaginary), any religious person can make up anything they like on god’s behalf and spout off about it all day. Strangely, religious people are unable to see how ridiculous this sort of ambiguity is. If “god” were a real, existing being, we would all know exactly what he thinks, what we are supposed to do and not do, etc. It would all be unambiguously communicated. A perfect, omnipotent, loving being would have no other choice. Should we try to eliminate religion? Religion is only a symptom of a larger problem: Humanity’s rationality waterline is ridiculously low. It is only one manifestation of a generally acceptable level of irrationality that permits things like anti-science attitudes, denial of climate change and peak oil, belief in homeopathy and other alternative “medicine” that doesn’t work, etc.. A person may be persuaded to reject Christianity, UFO’s, psi, and other “woo” but still lack the ability to identify and counter the effects of cognitive biases, manipulative advertizing, propaganda, etc., rationally analyze political, economic, and environmental policies, and consistently make life decisions that advance their goals and happiness. While religion is a direct problem, and some efforts should be directed against it, eliminating religion would only represent the most basic of steps toward a rational society. On the other hand, if we could find ways to teach the Methods of Rationality more broadly, while refining and improving them in a manner comparable to the way martial arts disciplines refine and improve methods of physical combat, so that there is a greater general expectation of rational, critical thought and action in society, a raised Rationality Waterline would submerge and drown most religion, woo, and cognitive failure.